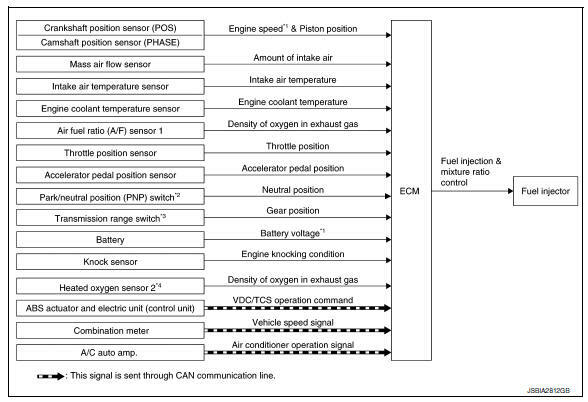 *1: ECM determines the start signal status by the signals of engine speed and battery voltage. *4: This sensor is not used to control the engine system under normal conditions. The three way catalyst (manifold) can then better reduce CO, HC and NOx emissions. This system uses A/F sensor 1 in the exhaust manifold to monitor whether the engine operation is rich or lean. The ECM adjusts the injection pulse width according to the sensor voltage signal. For more information about A/F sensor 1, refer to EC-19, "Air Fuel Ratio (A/F) Sensor 1". This maintains the mixture ratio within the range of stoichiometric (ideal air-fuel mixture). Accordingly, the difference between the basic and theoretical mixture ratios is monitored in this system. This is then computed in terms of вЂњinjection pulse durationвЂќ to automatically compensate for the difference between the two ratios. вЂњFuel trimвЂќ refers to the feedback compensation value compared against the basic injection duration. Fuel trim includes short term fuel trim and long term fuel trim. вЂњShort term fuel trimвЂќ is the short-term fuel compensation used to maintain the mixture ratio at its theoretical value. The signal from A/F sensor 1 indicates whether the mixture ratio is RICH or LEAN compared to the theoretical value. The signal then triggers a reduction in fuel volume if the mixture ratio is rich, and an increase in fuel volume if it is lean. вЂњLong term fuel trimвЂќ is overall fuel compensation carried out long-term to compensate for continual deviation of the short term fuel trim from the central value. Such deviation will occur due to individual engine differences, wear over time and changes in the usage environment.